Audi India has launched the new RS6 Avant in the domestic market with a bang and the launch was held in the presence of Indian star batsmen ‘Virat Kohli’. The manufacturer has already informed earlier this year about a 10 model launch plan and the new power packed Avant is one of them. Audi India has priced the new RS6 Avant for Rs. 1.35 crores only. The new edition of the Avant RS6 measures around 4979 mm of length, 1936 mm of with and 1461 mm of height respectively and the wheel base of the model is around 2915 mm. The manufacturer has launched new edition RS7 earlier this year and the new RS6 Avant features a lot of similarities with the former. RS6 offers boot space of about 565 litres normally and it can be increased to 1680 litres by folding the rear row of seats whenever necessary. The front fascia of the model comes with the exclusive Matrix LED head lights along with a new set of turn indicators. 20 inch full alloy wheels add to the elegance of the vehicle along with the unique metallic Audi emblem at the centre of front grille. RS6 Avant comes powered with the same 4.0 litre V8 TFSI engine that was offered with the current gen RS7 Sports back earlier this year. The respective engine is capable of churning out around 560 hp power at the peak along with 700 Nm of torque. The super car comes equipped with Audi’s Quattro all wheel drive system and the engine also comes mated with an eight speed tiptronic transmission gear box by default. As per the information, the new RS6 Avant is capable of attaining 100 kmph speed from rest within just around 3.9 seconds only. The top speed of the model has been electronically locked at 250 kmph which can be increased to 280 kmph or 305 kmph on demand. 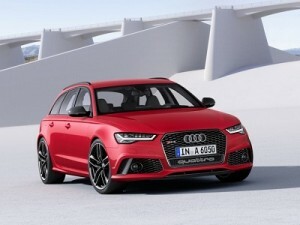 The starting price of new Audi RS6 Avant is around s. 1.36 crores only.